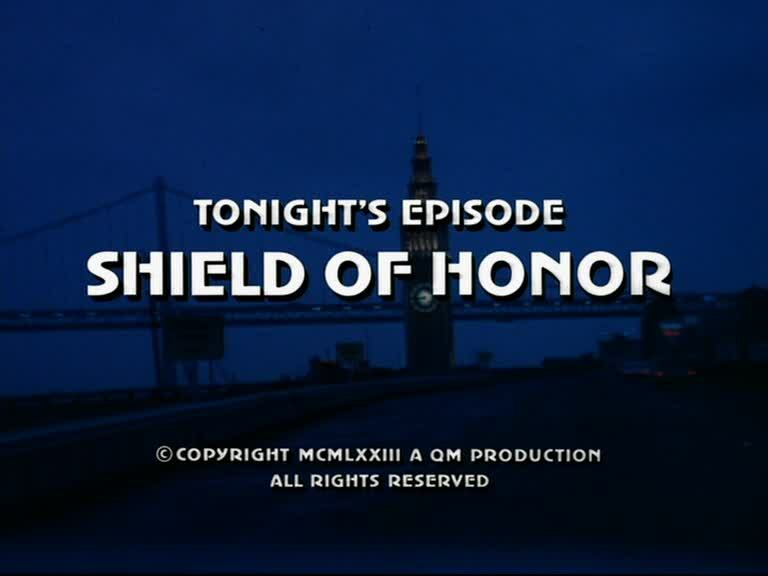 You can now access the screencaps for Shield of Honor through the episodes' page. A key witness is being transferred to the San Francisco Hall of Justice in order to appear before a court in a mob trial. Just before reaching the floor, the witness is shot to death in the elevator, leaving the two accompanying cops under a cloud although one of them shoots the hitman before picked up by a getaway car at the rear side of the Criminal Courts building. Stone and Keller team up with Lt. Bondini and Officer Andrea McCormick, who investigated the original case, in order to locate the killer and to identify the inside information leak. For the audience it soon turns out that the getaway car driver, Ted Cullen, is the father of the unborn child of Officer McCormick's younger sister; and so does Andrea McCormick. Facing the quandary she got into, Andrea tries to alert her sister without telling her the truth about her husband. On the other hand, Ted forces her not to report to her superior since he actually got the information on the key witness from her, and he is also very convincing by touching on the subject of her sister's unborn child. Following a short questioning with Andera's sister – who is still unaware oft he things going on - Mike asks Steve, who saw Andrea for a couple of times a few years ago, to set a trap for her. This episode starts in a van driving over Bay Bridge on its route to San Francisco. Most of the opening sequence was filmed inside the underground car park of the San Francisco Police Department and Criminial Courts on Bryant Street. Steve and Andrea McCormick drive to Emeryville in order to inform the witness' wife about her husband's death; she has an apartment in the Watergate Apartments complex at Powell Street and Commodore Drive. Police locates the withdrawn getaway car down in Visitation Valley, at the dead end of Raymond Avenue. Bondini and McCormick stake out the mobster's mansion at 393 Marina Boulevard (at Avila Street), and finally trace Ted Cullen's van driving to Visitation Valley again, where the injured hitman hides in a condemned house on Hahn Street. Locating this building was quite difficult but there's a short glimpse of a part of Cow Palace in the background when Ted is driving up the street, so I was finally able to identify the street and the location of the (now demolished) house. We are also taken to Andrea Cormick's apartment house at 1100 Gough Street, known as the Carillon Towers, for some exterior filming as well as to her sister's apartment on the lower end of Russian Hill. Mike finally books Ted Cullen in a house at the corner of Duboce and Church (we can see the street signs for a short moment).